"The legend of Orpheus is well-known. In Greek mythology, Orpheus was a troubadour from Thrace. He charmed even the animals. His songs diverted his attention from his wife Eurydice. Death took her away from him. He descended to the netherworld and used his charm to win permission to return with Eurydice to the world of the living on the condition that he never look at her. But he looked at her and was torn away from her by the Bacchantes. Where does our story take place...and when? A legend is entitled to be beyond time and place. Interpret it as you wish..."
The classic tale of Orpheus is about a musician who has to descend down to the underworld and reclaim his dead wife. He charms the gods with his music so they let him return his wife back to the world of the living but only on the condition that he must never look at her again. Jean Cocteau's surrealistic version of that story is quite different, as Cocteau changes the musician into a poet and sets the story in modern 1950's Paris. The one interesting twist that Cocteau adds to the legend is that of a romance between Death (the princess) and Orpheus which creates a sort of love triangle between the three characters. Cocteau's love for magic, and dreams makes his tale of Orpheus an enchanting beautiful fable with small, subtle special effects and devised trickery with the camera. The astonishing effects that he creates are so simple and yet extremely effective, of people walking through mirrors that look and feel like the ripples of water, reverse camera shots to portray characters springing back from the dead and creative sequences showing the characters getting pulled through the underworld with the light feel of a breeze. Orpheus is the central part of what is looked at as Cocteau's Orphic Trilogy, which consists of The Blood of a Poet and Testament of Orpheus. Orpheus was played by Jean Marais who was Cocteau's real life lover at the time and who also played the prince and the beast in Cocteau's enchanting masterpiece Beauty and the Beast. Jean Cocteau did not look at himself as a director but more of a poet and surrealist, who painted, sculpted and who wrote plays and novels, and you can see some striking parallels between the main character of Orpheus and of Cocteau himself. Instead of simply translating the Greek myth of the story Cocteau decided to make it more layered and complex with the idea of obsession and how art can consume and take over the life of an artist. One of the great pleasures of Orpheus is to watch the simplicity of the special effects all the while establishing characters within the fabric of its storyline, as people disappear and reappear, rubber gloves fly onto hands because of reverse photography and glass shatters and magically jumps back together. Orpheus is a enchanting dream-like fantasy filled with several wondrous and exquisite moments that explore the creative imagination of a great artist. Jean Cocteau once stated in an interview, "Orpheus is not at all a dream in itself: through a detail similar to that which we find in dreams, it summarizes my way of living, and my conception of life." The story begins at a café as a famous accomplished poet named Orpheus (Jean Marais) is scorned by other jealous poets who want to replace him. A princess (Maria Casares) orders her chauffeur Heurtebise to help carry a young rival and poet Cegeste who is drunk across the square. Orpheus goes outside to sit with a retired poet and they both discuss Orpheus' struggles on being a poet when others are scheming against him. Orpheus says, "No doubt they think I have nothing new to say and that a poet should not be too famous." He then asks his friend who the drunken man is and is told his name is Jacques Cegeste a poet. The friend says, "He's 18 years old and adored by all. His companion, the princess, finances the review that published his first poems." Orpheus says, "the princess is very beautiful and very elegant." Suddenly a brawl breaks out between Cegeste and several other people and when the police arrive to break it up; Cegeste is struck down by several men on motorcycles. Suddenly a Rolls-Royce appears and the princess orders Heurtebise to put the unconscious Cegeste in the back seat. Before leaving the princess turns and looks at Orpheus says, "don't stand there like a lamppost. Yes...you. Make yourself useful. I need you as a witness. Get in. Quick!" Orpheus is shocked by the request but gets in her vehicle. The Rolls-Royce then drives off from the maddening crowd and Orpheus is wondering why they are not driving directly to the hospital. He then realizes that the young poet Cegeste is dead as the Princess orders Heurtebise to turn the radio on. The radio repeats and says, "silence. Goes faster backwards. Three times. Your attention please: A single glass of water lights up the world." Orpheus asks the princess where they are going and she demands for him to be quite as they head to a abandoned apartment. When arriving Orpheus sees a bunch of leather-clad men on motorcycles that were the exact men that knocked Cegeste down and killed him at the café, waiting for them. The princess orders Orpheus out of the car and tells the leather-clad motorcycle men to take Cegeste's body out of the car and to carry him upstairs and lay him on the floor. Orpheus not knowing where he is believes he is dreaming and the Princess tells him, "you're clearly asleep. sleeping or dreaming, the dreamer must accept his dreams." The princess takes Orpheus to her bedroom and Orpheus demands an explanation from her and she says, "you have every right, my dear man, and so do I...so were even." Orpheus yells "there's a dead man in the next room and the men who killed him." The princess turns on the radio with the same radio announcement as before as she tells Orpheus, "You try too hard to understand what's going on, my dear man and that's a serious mistake." She orders him to wait in her room while her servants serve him champagne but Orpheus tells the princess that his wife expects him at home. The princess before leaving the room smiles and says to Orpheus that his wife can wait and will be all the more pleased when he returns. She walks into the room where the dead Cegeste is and she orders him to rise as Cegeste magically come back from the dead and rises up to his feet in front of her. She asks Cegeste if he recognizes who she is and he says, "my death." She then tells him he will serve her and obey her orders. She then orders her new slave to hold onto her dress while they both ripple within a mirror and walk to the other side which is the underworld the world of the dead. Orpheus sees this and is shocked by this unexplained phenomena. When Orpheus tries touching the mirror it's just solid glass and he has a sudden nervous breakdown and collapses. Orpheus wakes up and finds himself up high on a mountain. He runs down the mountain to find the princess's Rolls-Royce and the princess's chauffeur Heurtebise waiting for him. Orpheus gets into the car and Heurtebise takes him back to his home. At Orpheus' house his wife Eurydice is frantic wondering where her husband is with several of her friends including a woman named Aglaonice consoling her saying, "Men always come back. Their so absurd." Eurydice gets told by Aglaonice that Orpheus was at the café and was seen leaving with another woman and she starts crying. When Orpheus returns home he has Heurtebise hid the Rolls-Royce in the garage so his wife Eurydice does not see. Orpheus sees a reporter from The Sun who wants to question but he demands for him to leave and tells him to clear out. When Orpheus enters his home he finds several people there and he asks his wife what is wrong. Her friends say, "Orpheus, if you abandon your wife, it's only normal that she should call on those that love her." Orpheus gets furious and orders Eurydice's friends out including Aglaonice who he clearly dislikes. Aglaonice tells Orpheus before leaving with the others, "you've gone too far with your bad manners. You'll live to regret those words." After they all leave Eurydice says to Orpheus, "Aglaonice is dangerous! Her league of women is powerful! You're crazy!" Eurydice asks Orpheus where he was all this time but he doesn't want to get into it as he starts to pour a drink for the first time and angrily goes to bed. The chauffeur Heurtebise walks in and explains to Eurydice Orpheus was helping a woman transfer an injured man which is why he didn't come home. Eurydice and Heurtebise have a friendly discussion and Eurydice is worried that her husband is now upset with her and how she reacted. She then tells Heurtebise Orpheus is hansom and very famous and that she is actually shocked that he's always been faithful to her. Eurydice realizes the kettle in the kitchen is boiling over and Heurtiebise reminds her to turn off the gas saying, "I dislike that smell...and for good reason. I committed suicide by gassing myself. Since my death, the smell has pursued me. I mean...since I...almost committed suicide." Eurydice laughs thinking what Heurtiebise said was a joke telling him that he doesn't look like a ghost. During the night the Princess walks through Orpheus' bedroom mirror and watches Orpheus sleep because she has fallen in love with him but is not allowed to express it because it goes against her duty. Two days later Orpheus is found in the garage sitting in the Rolls-Royce as he becomes obsessed with the cryptic messages that are coming from the car radio which might be messages that could be inspiration for his art. His wife Eurydice is getting impatient with her husbands obsession with the radio because he has been in the car for several days. Eurydice tells her husband this obsession with these messages makes no sense and he says to her, "My life had begun to pass its peak. It was rotting stinking of success and of death. The least of these phrases is much more than any of my poems. I'd give all that I 've written for even one of those little phrases." Orpheus losses his temper with his wife and angrily orders Heurtebise to take his wife back in the house. Heurtebise takes Eurydice inside and Eurydice starts to cry telling Heurtebise that her husband has never treated her this cruel before and Heurtebise comforts her. Suddenly the police inspector calls to want to talk to Orpheus down at the station on the disappearance of Cegeste a few days earlier. Orpheus decides to leave and head down to the station with Heurtebise. When arriving Orpheus orders Heurtebise to wait for him in the Rolls-Royce and while on the street Orpheus suddenly sees the princess. Orpheus starts to run after her ignoring townspeople and fans who want his autograph; but the princess keeps disappearing and reappearing in different locations. Meanwhile at the police station the inspector is waiting for Orpheus arrival while Aglaonice and her league of women are waiting in his office accusing Orpheus of the tragic disappearance of Cegeste. When the disappearance of Cegeste reaches the paper Orpheus is the prime suspect because he left in the same vehicle as Cegeste after he was attacked and reappeared the next day in the same vehicle. Also the poems that Orpheus has been receiving through the radio transfers were the same poems that Cegeste wrote and was going to give to his publishers that day at the café right before the accident. When returning to the Rolls-Royce Orpheus decides to not see the police inspector after all until the situation with Cegeste's disappearance is cleared. Every night the princess returns to Orpheus's room and watches him sleep and one morning Eurydice is about to leave to confront Aglaonice on the accusations of her husband but gets killed by the princess's leather-clad motorcycle men while Orpheus is in the garage still trying to decipher the radio transmissions. Heurtebise sees the horrible accident and quickly carries Eurydice's body upstairs and lays her on her bed. Suddenly the princess appears through the bedroom wall with Cegeste and she orders Cegeste to continue and send phrases over the radio to Orpheus. The princess then asks Heurtebise for a pair of gloves but Heurtebise starts going against his master's orders because of his new-found love for Eurydice. She sees this and says to him, "you have no right to love in any world." He says to her, "you're in love with Orpheus and you don't know how to handle it." Heurtebise disappears into the garage to warn Orpheus that his wife is in great danger but Orpheus is so obsessed with his cryptic transmissions that he does not want to listen to him. The princess stands before Eurydice's body and orders Eurydice to rise from the dead and the princess says to her, "from now on you belong to the other world." When Heurtebise returns to the room the princess and Cegeste leave with Eurydice to the underworld by smashing a closet mirror and after walking through it the shattered pieces fly back into place. Heurtebise goes back to the garage and informs Orpheus that his wife is dead. When finding his wives dead body Orpheus grieves over her death and Heurtebise tells him he has a chance to confront the princess in person. Heurtebise tells Orpheus, "I'll give you the secret of secrets. Mirrors are the doors through which Death comes and goes. Look at yourself in a mirror all your life...and you'll see death at work like bees in a hive of glass." Orpheus asks him how he know these frightening things and Heurtebise tells him, "Don't be naive. Could I be her chauffeur without learning certain frightening things?" Orpheus doesn't think he can do anything since his wife is there dead in front of them but Heurtebise tells him that's one of her faces like the princess is one of death's faces. "Your wife is in another world. I invite you to follow me there," says Heurtebise. Orpheus says he'd follow her into hell but Heurtebise says there is no need to go that far. Heurtebise orders Orpheus to put on magic rubber gloves which will allow him to pass through mirrors like water. Orpheus puts on the rubber gloves and sticks his hand in the closet mirror and like a ripple of water the two of them both walk through. There is a mystical shot of Orpheus and Heurtebise going through the portal towards the underworld in slow motion passing drifters lost in time to a place that is called no mans land where it involves men's memories and the ruins of their beliefs. In the underworld Cegeste is in court giving his testimony to a panel of judges who serve as the authority structure of the underworld and give out the orders of its operation to their officers of death who include the princess. The princess acts as death as she and probably several others are ordered to constantly move between worlds carrying out their tasks on taking the living. The judges question Cegeste and the princess and ask her why she went against their orders taking Eurydice's wife when it wasn't in the contract. She tells them, "the laws of the other world are so different from ours." Heurtebise and Orpheus suddenly appear into the courtroom and Orpheus introduces himself. The judges then questions the princess's love for Orpheus which probably was the reason why she breached her contract and took Orpheus' wife. The princess admits her strong love for Orpheus and she is then forced by the panel of judges in signing a document. The princess and Orpheus are ordered to leave the courtroom and Eurydice is called in and the judges then question Heurtebise on why he went against his guardian the princess and didn't follow through with her orders when asked to . He then is asked if he is in love with Eurydice and he also admits he loves her and is forced to sign a document. The princess and Orpheus are alone embracing one another as the princess privately tells Orpheus how she really feels for him and how she had loved him even before they met. All the players in the story get ordered back into the courtroom to hear the verdict. The judges announce their verdict saying, "we the tribunal release Orpheus' death and her aides on bail. Orpheus is free on condition that he never speak of what he has seen. Eurydice is free to return to life in the other world on condition that Orpheus never look upon her. A single glance at her and he will lose her forever." Heurtebise is ordered to accompany Orpheus and his wife back to the real world and to watch Orpheus so he isn't tempted in looking at his wife. After the three leave the panel of judges disappear and the princess tells Cegeste, "Cegeste. If I were of our former world, I'd say...let's have a drink." When returning to the real world Orpheus goes outside his home and receives a anonymous threatening letter written by the townspeople who still accuse Orpheus in Cegeste's disappearance. Eurydice is inside the house looking at herself in a mirror but Heurtebise orders her to not do that because Orpheus could see her in the reflection. Heurtebise also asks Eurydice if what he said at the tribunal bothered her but she doesn't seem to remember him proclaiming his love for her. When Orpheus returns inside Eurydice hides under the table so Orpheus does not see her as he holds the letter he received up in the mirror to read out the backward words which say: "You are a thief and a murderer. We will meet on your grave." There's several funny close call moments where Orpheus almost looks at his wife with Heurtebise interfering and stopping his glances just in time. Orpheus starts to not like this way of life of not being able to live without looking at his wife. One funny moment is when Eurydice and him start bickering and Orpheus says to her without trying to look at her, "it's her fault! She could provoke even a corpse to turn around!" Orpheus even panics when seeing a photograph of her but Heurtebise reassures him that a photograph is not the same as a reflection. The next morning Orpheus' obsessions continue as he is in the Rolls-Royce once again trying to decipher the radio transmissions from the underworld. Eurydice can't bare the lack of love in the relationship anymore and so she purposely goes out into the garage and gets in the back-set of the Rolls-Royce to get behind her husband. Orpheus accidentally looks up and sees her reflection in the rearview mirror which causes her to disappear. Suddenly the townspeople who wrote the threatening letter he received earlier all appear outside Orpheus' home and the mob start breaking through the front gate ordering Orpheus to tell them where the location of Cegeste is. Orpheus pull a gun on the mob of people but in a quick attack they grab Orpheus' gun and he accidentally gets shot so Heurtebise grabs him and quickly puts him into the Rolls-Royce but Orpheus dies from the gunshot wound. Heurtebise flees with Orpheus to the underworld as he leads Orpheus through an invisible force that is trying to hold them back from getting through as they are grasping tightly on walls. Suddenly the two of them are yanked through the air by an invisible force. When finally arriving in the underworld Orpheus reunites with the princess saying, "I found a way to come to you again" as the two embrace. The princess asks Orpheus if he She then orders Heurtebise to help her break the fundamental rules of time and to send Orpheus back to the real world with his wife Eurydice; with the both of them alive and happy. In a beautifully shot scene, Heurtebise leads Orpheus backwards in time into the portal of no man's land as they return back through the closet mirror into his own bedroom. Orpheus removes the rubber gloves and looks at Eurydice as she wakes up from a bad dream on the bed. They both hold each other while Heurtebise watches with a sad expression on his face. Eurydice and Orpheus both talk about her being pregnant with their first child and how it could be a boy and girl and Heurtebise slowly backs away and disappears leaving the two lovers alone. Orpheus tells his wife, "there's only one love that counts: ours." Heurtebise returns back in the underworld with the princess and Cegeste. The princesses aids arrive to arrest her and Heurtebise for breaching the terms of their contract and reviving the lives of Orpheus and Eurydice. They both accept their punishment Heurtebise says to the princess, "We had to return them to their swamp." The two of them get arrested and taken away to Hades which is a most painful punishment for violating the rules and turning back time; now leaving Cegeste alone and aimlessly in the underworld. 1. The successive deaths through which a poet must pass before he becomes, in that admirable line from Mallarmé, tel qu’en lui-même enfin l’éternité le change—changed into himself at last by eternity. 2. The theme of immortality: the person who represents Orphée’s Death sacrifices herself and abolishes herself to make the poet immortal. 3. Mirrors: we watch ourselves grow old in mirrors. They bring us closer to death. 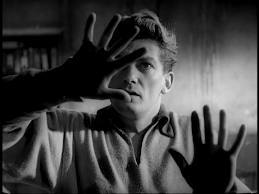 Jean Cocteau adds many elements from the culture of his time to the story of Orpheus. For example, the messengers of the princess of Death are grim, leather-clad motorcyclists and the underworld is represented by buildings in France which remained in ruins after World War II. Orpheus's trial in the underworld is presented in the manner of an inquest held by officials of the German occupation attempting to discover members of the French resistance, and at the very end of the film, the Princess and Heurtebise are prisoners, brought forward to face the tribunal, ominously elevated on a pedestal above them. There is a lot of subtle themes of sexuality within the film which probably led to its popularity in France. For instance there is the portrayal of the leather-clad motorcyclists and the look of the princess herself wearing a costume of leather corsets and high boots which bring in ideas of fetishism. Orpheus was played by the pretty boy Jean Marais who was Cocteau's real life lover and who also played the prince and the beast in Cocteau's masterpiece Beauty and the Beast. Cocteau looked at himself as more of an artist and less of a filmmaker and did several other projects on the side besides making films. He was a painter, sculpture and a writer of poems and you can see some comparisons between the main character of Orpheus and of Cocteau himself. Instead of simply translating the Greek myth of the story Cocteau decided to make it more layered with the idea of obsession and how art can take over an artists human priorities. After Orpheus returns to the real world he cannot forget that experience and starts to become more concerned in the underworld, his new-found love for the princess and its cryptic radio transmissions then the wants and needs of his own wife. Orpheus and Eurydice argue and bicker and he doesn't seem to even care when he is warned by Heurtebise that his own wife is in danger because he selfishly is engrossed within these radio transmissions in which he believes are the very inspiration for his artistic passion. Heurtebise seems to be their for Orpheus' wife and comforts her when needed. His feelings begin to grow for her and when he sees his master the princess order the murder of Eurydice; he disobeys her orders and no longer wants to work for her anymore. The princess's job is being the figure of death for the people she is ordered to take and the leather cycle-clad men are the ones who carry it out for her. She realizes she loves Orpheus (which is why she watches him sleep every night) and because of this she violates her contract and orders the death of Orpheus's wife Eurydice. (It was said Cocteau originally wanted either Greta Garbo or Marlene Dietrich for the role of the princess which would have been interesting.) 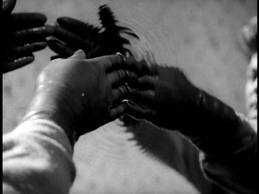 Cocteau directed his first film of what is considered his Orphic Trilogy which was Blood of a Poet in 1930. It was produced by the Viscount de Noailles, who financed Salvador Dali and Luis Bunuel's controversial short L'Age d'Or in the same year. 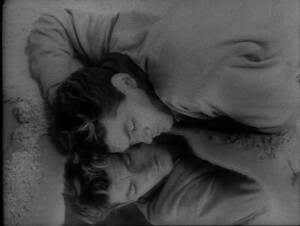 Ten years later he did Testament of Orpheus which is considered Cocteau’s final film of his Orpheus trilogy which also shows the final outcome to several of the characters in Orpheus. 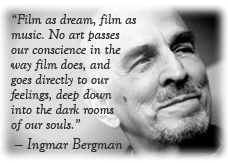 His masterpiece along with Orpheus is Beauty and the Beast which told the classic fairy tale using many of the same beautiful and subtle special effects and techniques used in Orpheus. There is some comic moments in the film especially the scenes after Orpheus and Eurydice get back to the real world and Orpheus is ordered to not look at his wife. There's a series of scenes where there are a few close calls of him looking at her but either Heurtebise stops him from looking in time or he orders Eurydice to hide under the table. I always wondered why the princess and Heurtebise decided to sacrifice themselves for the happiness of Orpheus and Eurydice by turning back time and saving their lives. This film shows an interesting contrast between real-life couples in the real world and the romantized versions of couples in the fantasy world. Orpheus and the princess seem passionately in love in the underworld and Heurtebise and Eurydice seem passionately in love in the real world. Yet, the princess and Heurtebise both sacrifice their happiness to bring Orpheus and his wife back together. I find that ironic since Orpheus and Eurydice always seem to find themselves quarreling and fighting and nether of them seem very happy being together, where if they were with the other two; everyone could be happy. Maybe the arrival of a child might bring a new-found spark in their marriage, but it just comes to show how a lot of married couples probably would be happier with other people. One of the great pleasures of Orpheus is to watch the simplicity of the special effects used in the film. People disappear and reappear, rubber gloves fly onto hands because of reverse photography and glass shatters and magically jumps back together. Orpheus is a beautiful enchanting fantasy filled with several wonderous moments. Jean Cocteau once stated in an interview, "Orpheus is not at all a dream in itself: through a detail similar to that which we find in dreams, it summarizes my way of living and my conception of life."